A wondrous amalgam of breathtaking natural beauty, amazing skyscrapers and kaleidoscopic cultures is the country of Vietnam. The rich history and various artistic manifestations of this nation are best reflected in its festivals, and if one of these seems to be underway during your trip, consider yourself lucky! Tet Nguyen Dan marks the beginning of the Lunar New Year in the Vietnamese calendar and is certainly one of the most revered festivals in the country. Deep rooted in the traditional values of family integration and worship of deities, this holiday is an occasion for the entire family to get together and indulge in rituals such as lighting fireworks, visiting temples, giving out flowers. This is an amazing time to be in Vietnam, for you can feel the spirit of the day reverberating through the atmosphere. Although it is a festival that is celebrated throughout the nation, smaller cities tend to shut down during this time. Perhaps, the capital city of Hanoi is the best place to celebrate this festival with the locals. Quan Su Pagoda or Ngoc Son Temple is a centre for solemn prayer rituals while Hanoi Opera House organises ostentatious parties and fascinating fireworks display. Take a dip into the folk culture of Vietnam during the Lim festival, which is another prominent festival celebrated at the beginning of the year. Quan Ho, which is a UNESCO recognised tribe, perform their exquisite dances and a number of games are played in celebration of this festival. Traditional costumes and dragon boats are a common sight. Danh du (bamboo swings), tug-of-war, wrestling, cockfighting, human chess, and blind man's bluff are some of the games that are played during this time and is an interesting way to interact with the locals. Lim Festival is celebrated widely in Lim village which is located in Tien Du District, Bac Ninh Province. Located 18 km from Hanoi, you can reach this destination by bus or rental car. Perfume Pagoda in Hanoi is the centre of the Vietnamese Perfume Festival which is celebrated the from the 6th day of the 1st lunar month until the end of the 3rd lunar month. Pilgrims from all over the country visit this shrine, and the pilgrimage begins with a dragon dance at Den Trinh Pagoda. The pilgrims then continue the journey on a boat along the Yen River up to the base of the Huong Mountain. From there, stone steps lead to the Huong Tich Cave, where food offerings, statues of deities and lit incenses create the perfect ambience of introspective silence. The Perfume Pagoda in Hanoi is the place to be if you want to take part in the Vietnamese Perfume Festival. Dedicated to the goddess Lieu Hanh of Phu Giay Pagoda, this festival is a vivid celebration that is believed to bring good fortune upon its people. Pilgrims wear traditional Vietnamese clothing and carry embellished bamboo relics to the temple of the goddess. As a part of rituals, various games like capture-the-flag, human chess, lion dancing, and wrestling are played to celebrate the day. Many colourful presentations of folk dance, classical songs, satirical musical theatre and chamber music are also a part of the festivities. Villages in the Kim Thai Commune celebrate this festival and the best place to celebrate being the Phu Giay Temple. Hung King Temple Festival is celebrated in the honour of Kinh Duong Vuong, who was the first king of Vietnam in 2879BC. A hundred lanterns adorn the night sky as a commemoration of this mighty king's contribution, while elaborate worship rituals are held in the Hung Temple. The next morning sees a flower ceremony that is held in the Den Thuong or Upper Temple. This is the ancient site where the royalty offered their prayers to the Gods and Goddesses. 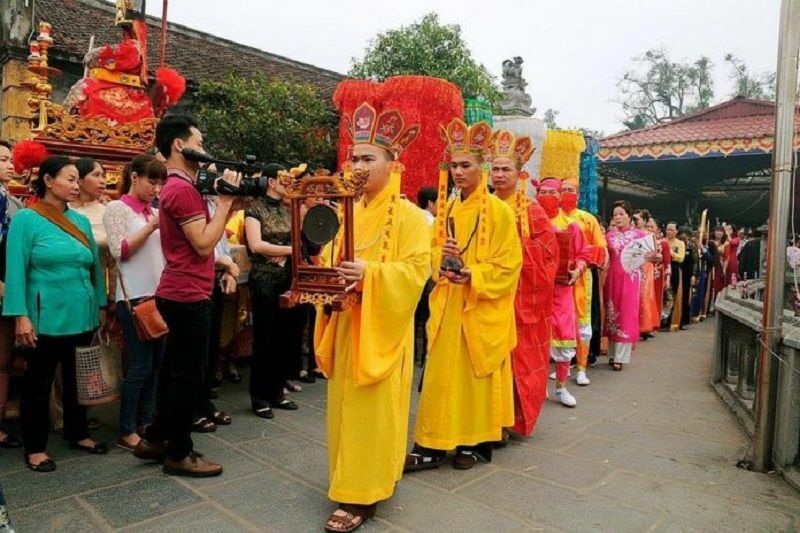 The ceremony is concluded with a procession that starts at the foot of the Nghia Linh Mountain while enchanting performances of xoan classical songs and ca tru classical operas. As a dedication to the colourful and illustrious legacy of the Nguyen Dynasty, Hue Festival is celebrated in the UNESCO-listed Hue City. This celebration is a unique display of numerous games, performances and cultural renditions and is a magnificent sight to behold. The formal celebration of this festival began in the year 2000 as a part of preserving the traditions and customs indigenous to Vietnam. Dialogue of Drums and Percussions, Hue Poetry Festival, Ao Dai Fashion Shows, kite flying, human chess, and boat racing, as well as street performances, film screenings and art exhibitions, find their way to the streets. Buddhism is one of the most widely practised religions in Vietnam, and certainly, the birth anniversary of this deity is an occasion worthy of a grand celebration. This auspicious occasion falls on the 8th day of the 4th lunar month, and temples are decorated beautifully for the celebration. Devotees make offerings of flowers, fruits and traditional Vietnamese food to the God and seek his blessings. Street parades and prayer sessions are held in large numbers, and the entire community offers reverence to the Almighty. Pap Bhao in Hoi An celebrates this day with great vigour and gaiety. The morning calls for a procession of monks along the streets of the Ancient Town. This is followed by throngs of locals queuing up to visit the temple where they perform religious rites and listen to Buddhist scriptures. Evening time witnesses a bubbling parade on the Old Town main road. Animals are released while flower garlands around their necks and lanterns lie perched along the banks of the quaint river. This is an important day in the Vietnamese calendar, as it is dedicated to the spirits of the departed. Also known as Tet Trung Nguyen, this is how the Hungry Ghost Festival is celebrated in Vietnam. This day takes place on the 15th day of the 7th lunar month, and it is believed that on this day, souls of the ancestors visit their children to bless them. On the eve of the temple, people pay respect to their near and dear ones who have left for their heavenly abode and perform prayer rituals in temples. Offerings of flowers, sticky rice cakes, sugarcane, and fruits are presented to them, and items such as paper money and clothes are burned as a part of the rituals. Hue is one of the best destinations to experience the sombre subtleties of Wandering Souls Day. The many pagodas and shrines here hold solemn prayer services to honour the dead. This day is also called Cold Food Festival (Tet Han Thuc) as chilled dishes such as banh troi (floating rice cake), and Banh chay (glutinous rice balls with mung bean paste) are eaten. Celebrating the harvest of the year is the Mid Autumn Festival, where the spirit of happiness and prosperity reigns the atmosphere. This day is celebrated on the 14th and 15th day of the lunar month, and all age group celebrate it uniquely. Children carry paper lanterns across the town; colourful lion dances embellish the streets and food booths selling sticky rice, mooncakes, fruits, and various sweets adorn the sideways. Altars are set up in each household during the night, and various offerings are made to the full moon. Hoi An has a beautiful celebratory procession in place for the festivity and should not be missed. Children have a gala time on this day and get to participate in various events such as essay writing, drawing and colouring contests. Mesmerising vistas of floating paper lanterns lining the Thu Bon Riverside and Japanese Covered Bridge adorn the town. This festival is a fantastic blend of tradition and creativity and displays the myriad hues of light and life in Vietnam. 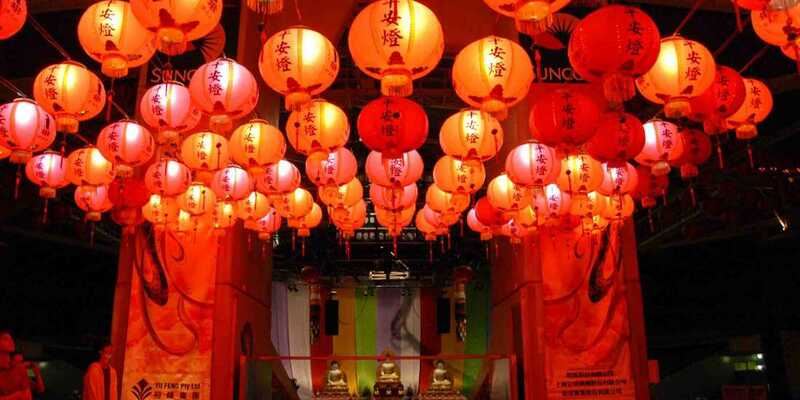 Celebrated on the 14th day of each lunar month, every outlet, house and businesses in the Ancient Town switch off its electrical lighting equipment and lights away a dim candle settled snugly in an ornate lantern. The entire city is lit up with thousands of these paper lights and my! What a sight it is to behold. The soft amber hue of the flame within shines against the Kohl of the night and turns this town into a magical place. The entrance to all temples is free of charge during this time and you can see monks and locals holding candlelit ceremonies. The Ancient Town of Hoi An is the best place to experience the true spirit of this festival. Musicians playing traditional instruments, Chinese chess, poetry readings, and lantern-making classes dominate the city on this day, and these are surely some pretty interesting things to learn more about. There can be no better way to indulge in the very spirit that makes up a country than to experience its festivals, and when it comes to Vietnam, you surely will be pleasantly surprised!